Edythe Klumpp and the "Case of the Century"
Every city in every era seems to have its “Crime of the Century” and during the 1950s in Cincinnati, that was the 1958 murder of Louise Bergen, a Cincinnati housewife. The trial of her accused killer, Edythe Klumpp, was held during the summer of 1959. The case was sensational for many reasons – a “love triangle” between Edythe, Louise, and Louise’s husband, Bill Bergen; Edythe’s history of two divorces and other affairs; the participation of Foss Hopkins, Edythe’s defense attorney; the specter of the death penalty for a woman; and the controversial role of Ohio Governor Michael DiSalle in Edythe’s ultimate fate. Louise Bergen’s body was found burned near the public beach at Cowen Lake on the evening of November 1, 1958. The subsequent investigation zeroed in on Bill Bergen’s live-in lover, Edythe Klumpp, who confessed after failing a lie detector test. Edythe claimed that the killing was accidental, that a gun went off during a struggle and hit Louise in the throat. But Hamilton County Prosecutor C. Watson Hover disagreed, charging her with first degree murder and seeking the death penalty. After being convicted and sentenced to die in the electric chair, Edythe changed her story. She now claimed that Bill Bergen was present at the time of Louise’s death, and that it was he who pulled the trigger accidently, rather than Edythe. She said they cooked up the story that she told because Bill believed the court would be easier on a woman. She also said that Bill would harm her children if she didn’t go along. She then put the scene of the crime at a different spot – Stratton Drive, a secluded side street in Anderson Township. Evidence soon found at the police station – part of a necklace (the other part of which was found on Louise’s body), Louise’s eyeglasses, and a pair of children’s shorts with blood on them – corroborated this new scene. 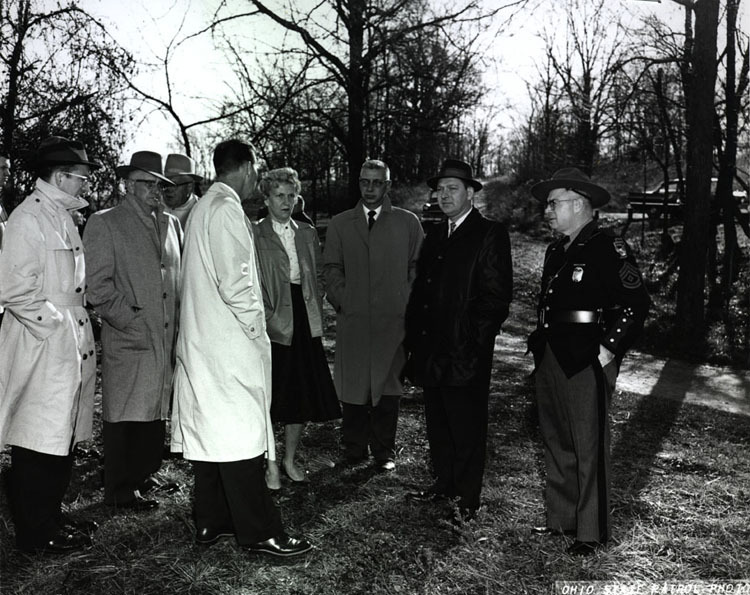 Initially found at the time of the murder, the evidence was not linked to the crime since Edythe had given the scene in her confession as Caldwell Park, located on the other side of town. Foss Hopkins went through the usual appeal process, but no higher court would hear Edythe’s case. Armed with the new confession, the newly discovered evidence, and Edythe’s mother and children to plead her case, Hopkins met with Governor Michael DiSalle to talk about clemency. DiSalle, a strong opponent of capital punishment, agreed to review her case, launching his own investigation, carried out by the Ohio State Patrol. DiSalle’s investigation led him to believe that Edythe’s second story was much more plausible. It was suggested to him that he interview Edythe under the influence of sodium amytal – a so-called “truth serum.” He agreed, and along with a doctor visited Edythe in her cell at the Ohio Reformatory for Women in Marysville. This was a very controversial move by the governor, and when he announced that he believed Edythe’s story and commuted her sentence, the public was in an uproar. Many believe that this act cost him re-election the following year. Edythe completed her sentence in Marysville, gaining parole in 1971. She remarried, moved to Kentucky, and lived the rest of her life in relative obscurity. She died naturally on Christmas Eve in 1999. 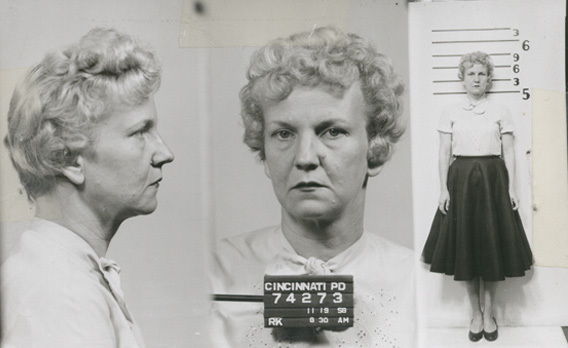 The UC Archives holds a collection from the Hamilton County Court of Common Pleas that includes the Prosecutor’s case records for Edythe Klumpp. Also included in the collection are records from the trials of Anna Marie Hahn, a German immigrant executed for poisoning several elderly men, and Robert Lyons, a Cincinnati water meter reader acquitted in the murder of socialite Audrey Pugh. The collection gives an interesting look into the Klumpp case and includes the complete trial transcript, photographs, investigation reports, court and police documents, and prosecutor’s notes. I have been researching the Klumpp case for over five years, using the collection here in the Archives as the base for most of my work. Recently an Australian production company, Beyond Productions, contacted me about working with them as an expert on a segment of their television program “Deadly Women” that will feature the Edythe Klumpp case. After an initial phone interview, a film crew visited the UC campus on February 22 to do an on-camera interview that will be used in the program’s final production. 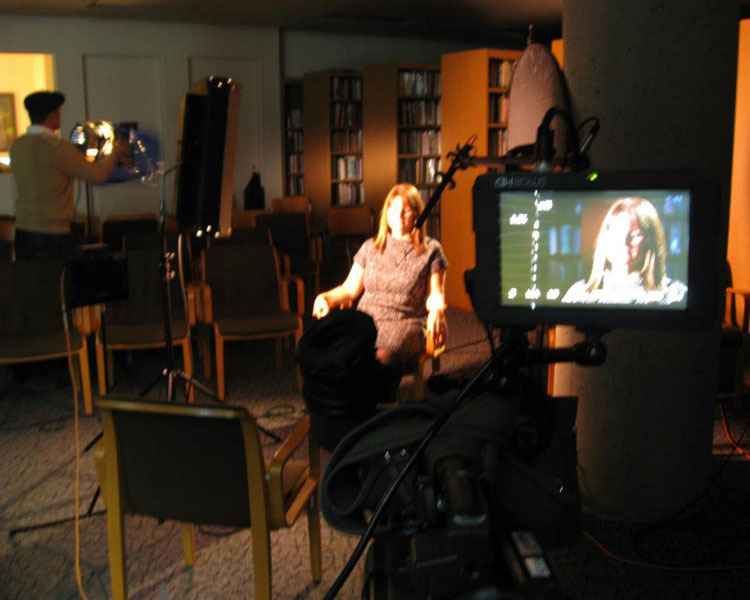 We did the interview in Langsam Library’s Elliston Poetry Room, which offered a nice backdrop. It was definitely a unique experience for me and allowed me to share my research with others. The program will air on the Investigation Discovery channel during their next season, which begins in the fall of 2012 and runs through the following January. We’ll blog again when an exact air date is known.